Blenheim Palace is not, and never has been, a home to the British royal family – and yet it is a palace. Not only that, it is considered by many to be the most magnificent residence in Britain, a rival to Queen Elizabeth II’s many not-so-humble abodes. Blenheim Palace was given as a gift to John Churchill, first Duke of Marlborough by Queen Anne in the early 18th century in recognition of a job well done. 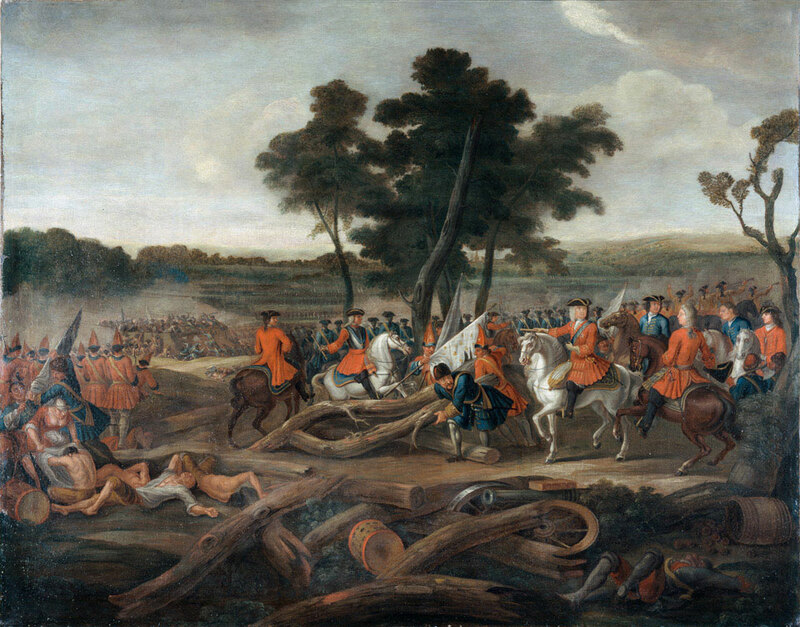 The Duke had won victory for Britain against the French-Bavarian army in the Battle of Blenheim of 1704, a major turning point in the War of the Spanish Succession. On behalf of ‘a grateful nation’, Queen Anne gifted the two-thousand acre royal manor of Woodstock to the Duke. She also agreed that the British nation would foot the bill to build the Duke a palace. The Duke hired John Vanbrugh to design a grand mansion in the English Baroque style that would do justice to the Duke’s great military victory and the splendour of the reign of Queen Anne. The cornerstone of Blenheim Palace was laid in June 1705; but soon afterwards, Queen Anne’s extravagant gift began to seem more like a curse. The Duke’s first mistake was going against his wife’s wishes in hiring Vanbrugh. The Duchess and Vanbrugh were at each other’s throats before the foundations had even been laid. In 1717, Vanbrugh resigned from his position following a row with the Duchess and in 1725, it was said, the Duchess denied Vanbrugh entry to Belnheim Palace when he visited with an architect friend. The rift ran deep. The Duke’s second mistake was an error of accounting. As in every episode of real estate reality TV, the budget for building the Duke’s dream home snowballed disastrously. The Duke’s initial, and clueless, estimate of £40,000 quickly became £240,000 – a difference no amount of DIY or discount fixtures and fittings could hope to cover. And while the Duke was away at war, unpaid workers and manufacturers were often at the door. Parliament put a complete stop to payments towards the Duke’s magnificent moneypit in 1712 when Queen Anne dismissed the Duke and Duchess from court. As rumours of murky political intrigue against the Crown circulated, the Duke and Duchess thought it better to be out of sight and out of mind and retreated into continental exile. There they stayed until Queen Anne died two years later. On their return to England, work on Blenheim Palace resumed on the Duke’s dime and was largely completed by 1722, although construction and decoration continued until 1733, eleven years after the Duke’s death. By the time it was completed the design of Blenheim Palace was already considered to be behind the times. In the 1730s British architects were beginning to embrace features of European Palladian architecture. This style borrows from the classical temple structures of the Ancient Romans and Greeks. By comparison, Blenheim was indulgent, excessively decorative and monstrous in its proportions. With 187 rooms and seven acres under its roof, Blenheim Palace is colossal in scale. The main entrance at Blenheim features a towering portico with curved arcades stretching left and right and connecting to the service and stable wings. The Great Court, every facet of which is richly ornamented, is 90m deep. The four corners of the central building at Blenheim are topped with towers that are finished with 9m high pinnacles carved by Grinling Gibbons. The overwhelming impression when walking through Blenheim’s many rooms is that the palace was scaled for giants, in which case the furniture is way too small. By standing in the great hall and looking up, visitors can see 20m of marble Corinthian columns and tall arches. These arches point to a magnificent ceiling hand-painted by Sir James Thornhill to depict a map of the building’s namesake, Blenheim battlefield. The great hall leads into the saloon which opens up on either side to what was originally concieved as state rooms and later used as drawing rooms. Presumably these rooms were used by King George III who, on his arrival with Queen Charlotte in 1786, spluttered, “We have nothing to equal this!” The Long Library at Blenheim is aptly named, stretching 55m in length, and was originally designed to be a picture gallery. Like all great British homes of its day, Blenheim has its own chapel. Home to a marble tomb designed by William Kent the chapel holds the remains of the first Duke and Duchess. A palace designed to represent the power of the English nation and the first Duke’s victory over foreign foes, Blenheim was described by Vanburgh as a creation of ‘beauty, magnificence and duration.’ In order to fulfil Vanburgh’s hopes for ‘duration’ subsequent Dukes of Marlborough have had to get creative to cover the cost of its maintenance. To this end, Blenheim was one of the first of the great British houses to open its doors to the fee-paying masses. From the late eighteenth century onward Blenheim was periodically open to the public and used entrance fees to fund repairs and maintenance across the behemoth building. By the late 1800s the ninth Duke of Marlborough was looking for a more permanent solution to his family’s financial burden. In what was described as the ultimate ‘cash for class’ union, the Duke agreed to marry Consuela Vanderbilt, American heiress to part of the Vanderbilt fortune. The marriage netted Consuela a duchess’s coronet and provided the Duke with the funds needed to keep Blenheim ticking over. The eleventh Duke, John George Vanderbilt Henry Spencer-Churchill, had no American heiress offering her hand in marriage and instead dedicated his 42-year ownership of Blenheim to making the palace financially viable as a business. By 1950, the money Consuela Vanderbilt had brought into the family was no longer enough to keep Blenheim’s hundreds of service staff in wages and uniforms, and the eleventh Duke again opened the doors of the palace to the public. Now ordinary folk could access parts of Blenheim Palace never before seen by non-aristocratic eyes. The family retained a 46-room, four-storey block with twelve bedrooms and ten bathrooms and a huge staff of domestic servants for themselves. The eleventh Duke passed away in October 2014 and was suceeded by his son James, now the twelfth Duke of Marlborough. With the help of his younger brother, Edward, the current Duke has begun a campaign of regeneration at Blenheim. Determined to keep Blenheim relevant in a rapidly changing world, the brothers have opened up the family’s private quarters and the servant’s quarters to the paying public and established the Blenheim Art Foundation. The foundation has commissioned work from provocative contemporary artists and installed it in purpose-built exhibition spaces within the palace. What the first Duke would think of the work of Ai Weiei or Lawrence Weiner we can only imagine.